Norbert: What Can Little Me Do? 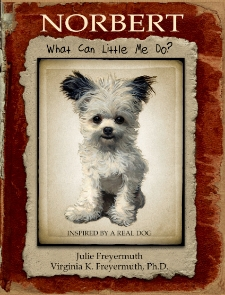 is an internationally award-winning children’s picture book inspired by a real 3-lb registered therapy dog. The story shows that you don't need to be big to make a BIG difference in the world. This lovable, exquisitely illustrated tale, published by a mother-daughter team, shows how a tiny hero discovers his unique gift for helping others while showing children that each person has his or her own unique gifts. This is the first book in a series. Norbert: What Can Little YOU Do? is the second book in the series, is available for pre-order and will be published in February 2015.